NEWARK — It exemplified the national state of confusion that took place across the country earlier this week as the main components of the Affordable Care Act took effect. Richard Roper, chairman of the deacons at the Bethany Baptist Church, stepped to the microphone at the beginning of a question and answer session this afternoon on what's become known as Obamacare . “I think I have more questions here than there are people in this room,” he said. NEWARK — His campaign ads boast that crime is down (well, sort of). They say he’s brought jobs to Newark (unemployment is down one point in a year). And while he campaigns for the U.S. Senate, his sexuality, weight, and his tweets with some Portland stripper are all out there for national speculation. NEWARK — It was a late homework assignment and Newark school district officials missed the deadline Thursday, after teachers union officials refused to sign off on an application for $30 million in coveted federal Race to the Top funding. The state-controlled district accused the Newark Teachers Union of playing politics, while its president, Joseph Del Grosso, said he was not asked for his input until Tuesday, criticizing the application as a waste of money. "It’s riddled with pork," complained Del Grosso, who heads the 4,200-member union. "The thing should be called Race to the Hog because that’s what’s going on. It’s not about funneling money into classrooms." NEWARK — Joshua Lyons lays on his back, chatting up a storm with his physical therapist at Children’s Specialized Hospital in Newark. As she stretches his legs on the big blue mat, getting him ready for a workout, he’s going on about homework. Then he shifts to Chuck E. Cheese, the giant singing mouse he wants to hug the next time he’s at Chuck E.’s house. "Like this," Joshua says, hugging himself, rocking back and forth. The Newark Museum salutes the talent and generosity of photographer George Tice with a new exhibition — Seeing Beyond the Moment — perfectly timed for the artist's 75th birthday. The show, on view through Feb. 2, features landmarks works from the Newark born photographer who is best known for his large-scale black and white images of New Jersey. Among the two dozen works are examples of prints he made for other photographers, including giants Edward Steichen and Edward Weston. The show also features works by some of Tice's most accomplished students, including Sally Mann and James Perry Walker. 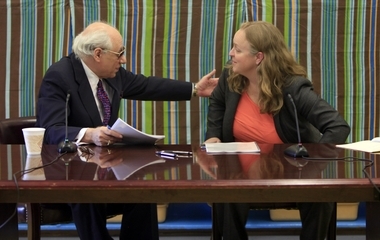 Joseph Del Grosso, Newark Teachers' Union President, and Cami Anderson, the Newark Schools Superintendent, appear together in an October 2012 photo. The union and the district are in a $30-million stand-off over a federal Race to the Top application. NEWARK — The train's leaving the station - literally. As the Race to the Top application deadline to apply for $30 million in grants passed at noon today, the divide between the city’s teachers’ union and the school district’s administration remains unresolved. Joseph Del Grosso, the Newark Teachers’ Union president, maintained this morning that he would not sign an application because he was not asked for his input until Tuesday — and even referred to the money as "millions of dollars of stupidity" that won't trickle down to the classroom. After five years, a dream came true to build a true 21st century environment for the schools. There are three charter schools that will be in the Teachers Village, and the best part of it is that the tutors can live in the same building in a safe environment. Three students who attended the three different charter schools in the building - TEAM Academy, Discover Charter School, Great Oaks Charter School - talked about their experience at the new building, and their respective schools - and received a round of applause. Newark Schools Superintendent Cami Anderson said, "Some schools has great results, and it's my job is to get the same as anywhere and everywhere tomorrow, because our young people cannot wait...This is a civil rights issue. One Newark is a simple promise, but difficult to deliver." NEWARK — The Newark school district will likely lose any chance of winning roughly $30 million in federal funds because of a dispute between union and district officials over the city’s "Race To The Top" application. While union leaders say they were not given enough time to help draft the application, a spokesman for the district said the union canceled several meetings to discuss the proposal. Joseph Del Grosso, president of the Newark Teachers Union, said late Wednesday night he will not sign the application by Thursday's noon deadline because he was not asked for his input until Tuesday. In addition, he said, very little of the grant money would have benefited students. 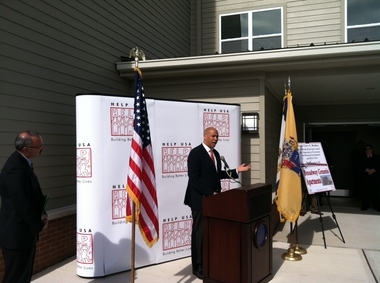 Newark Mayor Cory Booker gives a speech at a press conference today about Broadway Genesis Apartments, a complex offering homes to veterans for reduced rates. About eight months ago, Juan Davila and his wife spent their winter nights sleeping on a stage outside the Exchange Place pier. After being forced to leave his mother's apartment in Jersey City following a six-week stay, Davila said he just couldn't find a place to live on the $847 he was earning each month from Social Security. "I had nowhere else to go," said Davila, who is disabled. "Everywhere I went it was $800 a month for a little room." Davila's luck started to change in July, when a contact at a church referred him to HELP USA, a New-York based housing nonprofit group. Davila ended up with a furnished one-bedroom apartment for about $233 a month. Barbara Arroyo, director of Milagros Angels food pantry gives food to a little boy on its last day of operation in Newark. The pantry had to close when a church community center could no longer afford for the pantry to be there. NEWARK — The church community center was packed 300 deep, maybe more. The people were sitting in folding chairs, rows of them, waiting to lug food that others before them were struggling to carry down the stairs onto a Newark street. Volunteers stuffed boxes, hampers and shopping carts. They filled laundry bags with donated bread, meats and vegetables so dinner that night would fill a few extra bellies at someone’s dinner table. It’s like this twice a month at the pantry Barbara Arroyo set up at Temple Rock of My Salvation, a 12-year-old church in the city’s North Ward. The head count exceeds 1,000 easily, but next month will be shockingly different for the hungry. Next month, the number will be worse, meaning lower, meaning zero unless Arroyo finds another place to give out food to a population that is largely Latino.